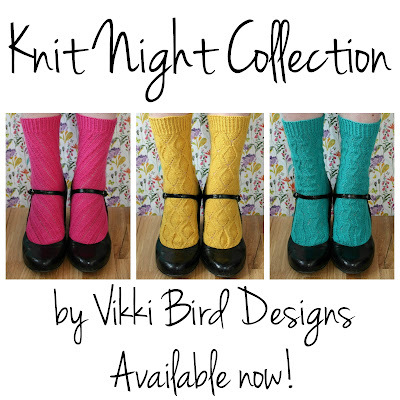 Vikki Bird Designs: Socks in five days! After I posted on Saturday, the bank holiday weekend continued to be a bit damp. We did manage to get out at least once (to a chick hunt at the botanical garden; we walked round the whole ten hectare site, even though it rained throughout - it turns out hunting chicks is very motivational! ), but otherwise entertained ourselves at home. We also ate our way through plenty of Easter eggs and had fun having an Easter egg hunt in the garden. While I had plenty of time for knitting, I didn't quite get my socks finished by the end of the weekend (I did try to do some dressmaking too, which used up more time than I had anticipated; it always does). I finally cast them off yesterday evening, with just two tiny scraps of yarn to spare. They're a tiny bit shorter than I would usually make socks, but by under an inch and I am really pleased with them. I might even make concurrent socks again as I liked casting them off back to back. The yarn was from Cuddlebums and is really soft. Everything about these socks is a delight! Another thing I was excited about this weekend is Bank Holiday TV. Doctor Who returned on Saturday evening, and while I haven't enjoyed the past couple of series (I didn't feel any chemistry between Clara Oswald and Peter Capaldi's Doctor) I was excited for a new series with a new assistant. And I loved it. It started with a charm that had been missing for a while, and the 'monster' genuinely had me scared (as ever with Doctor Who, it is always the monsters based on innocuous things (this time it was water) that give me shivers; the Weeping Angels are my all-time favourite). I like the new assistant, and she and the Doctor seem to gel well, so I'm looking forward to the rest of the series. I am a huge fan of the rebooted Robot Wars, having said that I didn't want to watch it when it stated last year (I didn't watch it as a child), then falling in love with it. The teams are so passionate about their robots and about the competition, as well as being an excellent starting point for discussions about engineering with our five year old. I had thought the final would be aired last week, but apparently the golf was more important, but the Robot Wars final did make excellent viewing while we are our Easter Sunday roast dinner (and the team I had been supporting from the start of last series won, hooray!). The other thing I am really enjoying on TV at the minute is Top Gear. After the last, disastrous series with Chris Evans (which I gave up watching after a couple of episodes), I was a little trepidatious about the new series, but I've found it very entertaining. The new mix of presenters is friendly and fun, and the guests have been amazing (David Tennant, James McAvoy and Tamsin Greig have been highlights, especially the banter between Tamsin and Matt Le Blanc, who worked together on Episodes, which is another favourite of mine). All in all, excellent bank holiday TV! Hope you had an excellent Easter weekend and that the return to work wasn't too much of a shock to the system. 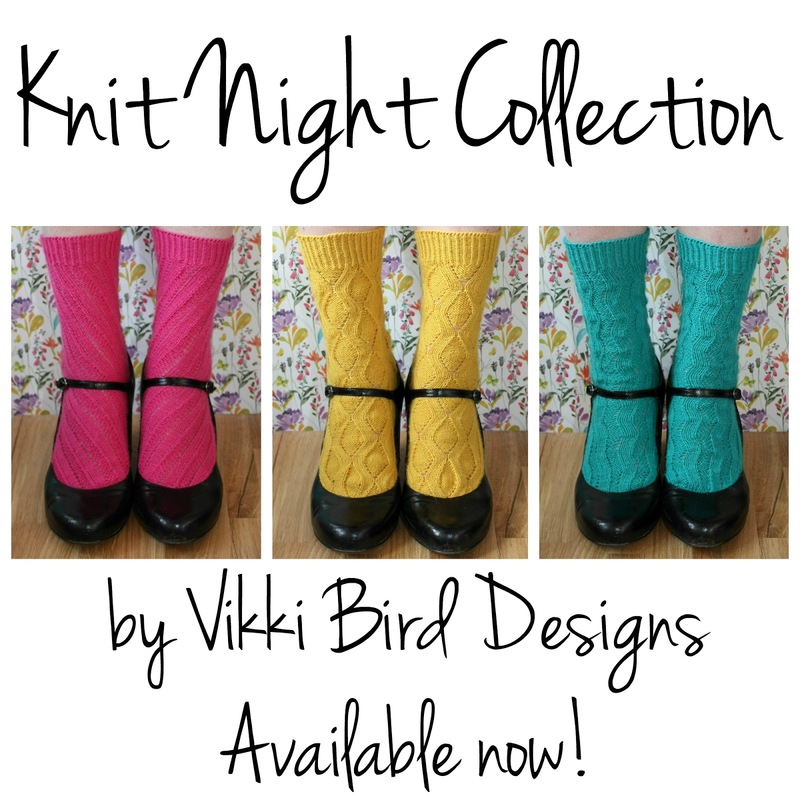 There's still time to purchase my Knit Night Collection of toe up socks with 10% discount using the code KNITNIGHT and the KAL is in full swing over in my Ravelry group. It would be lovely if you could join us.